Seattle has a rich and vibrant community of POC food activists and business owners who need to link up and support our collective effort to shift the food narrative and make change in our food system. We are SUPER excited to coordinate our first ever event in Seattle on Saturday, September 12th from 3 PM to 6 PM at Pratt Park in the Central District. 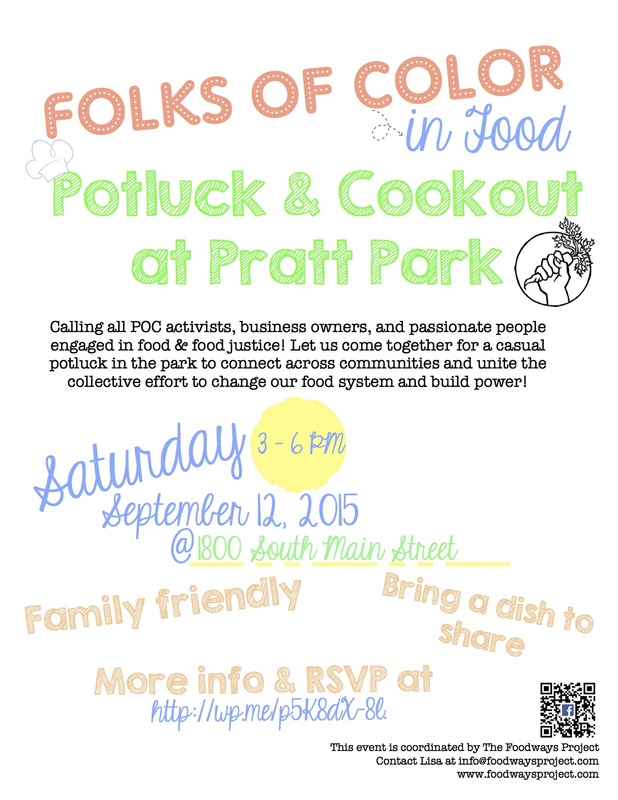 This casual potluck is an opportunity to bring all of the amazing people we know in the food world together and meet those with which we are not yet acquainted! As a potluck, we’re asking folks to bring a dish to add to the table. This is a family-friendly event and allies are welcome to attend! In the spirit of connecting and building relationships please feel free to bring and share business cards and other information about your agency or work, however we kindly ask that no vending or exchange of monetary currency occur. If you’re so compelled, BYO plate & silverware to cut down on the environmental impact of disposable foodware. If you’re a Facebook user please RSVP via our Facebook event page and share widely! Otherwise, feel free to contact us at info@foodwaysproject.com with any questions. We hope to see you and yours there! Note: we are making no profits from this event. Folks who can volunteer their time with set up, tear down, and clean up are much appreciated! If you’re a musician and are willing to add some tunes to the mix please contact us.